He’s one of the best at setting goals or resolutions or whatever you want to call them. I’m not a big fan of New Year’s Resolutions. It seems that most people make resolutions this time of year and the effort just isn’t there. We treat the resolutions more as dreams than as goals. We don’t really put actual effort into the resolution or if we don’t there is no real plan for giving the effort a chance to succeed. For example, we set the goal to lose 20 pounds. We put in the effort to go to the gym, but that plan is too vague and we may start going three days a week, then two, then one and by March we’ve actually gained five pounds and we are thinking, “Screw it”. But this year I’ve been reading Arnold Schwarzenegger’s autobiography, Total Recall, and he’s an interesting case study on resolutions. Arnold doesn’t really call it a resolution, but he has always made it a routine to set goals for each year on the first of the year. So it’s really like a resolution, but Arnold has a great approach. A recent goal of his was something he laid out on January 1st, 2002. He set the goal to explore running for governor of California. Within a day or two he was already having meetings with people in government and in other areas of life that could provide him insight. And he didn’t stop there. Remember, the initial rush is usually the easiest part, but Arnold kept things going. He would take the advice of the people he was meeting with and form specific goals. Through his meetings he figured out that a good goal would be to work on a ballot initiative over the next year and work to get that approved. This would allow him to see for himself if he could work in politics and it would build his credibility with voters as far as politics goes. So in 2002, Arnold worked on that specific project while also filming Terminator 3. 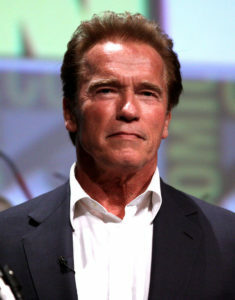 There was an election in 2002, but Arnold decided not to run at that time. There was a recall initiative brewing and Arnold made the decision in mid-2003 to jump on the opportunity and run for governor and he ended up winning. Arnold seems to be a genius with his goal setting. I’m sure he hasn’t achieved all his goals, but he’s had some really good success. He had a goal to become a bodybuilder. He became the most successful and most famous one of all time. He did the same with movies. He was successful in real estate. He became the governor of California and won re-election. A few things stand out about Arnold and his goal setting or resolution setting. First, his goals are mostly long-term. You don’t set a goal to become the governor and expect it to happen in a year. You don’t set out to be the biggest movie star in the world and expect to have it happen in a year. Arnold was always looking at the long-term. He didn’t start in The Terminator until he was in his mid to late ’30s. He knew it would take time. He would start with his big vision or goal and then work backwards to create mini goals, so to speak. For example, in order to become a big movie star he knew he would need acting classes. He worked tirelessly at that. He also spent time with successful actors, soaking in their knowledge like a sponge. Second, he set himself up for success with plans, systems and mechanisms. We’ve kind of been seeing this in the examples up to this point. On the way to being a bodybuilder, Arnold would work backwards and see all the steps he needed to reach the ultimate goal. He would look at every step along the way from the best in the world and what they did to what bodybuilders were doing at all levels including at the beginning. He did the same when he moved to America. He had an interest in business. He had a goal to be successful in business. That’s pretty vague, but he made meetings with successful businesspeople and found an interest and passion in real estate. Then he went to college to take business classes and English classes. He apprenticed with real estate developers and he worked in construction. He didn’t just have dreams. He had goals and he put plans in place that would lead him toward success. I’m working on a few goals for the New Year (and beyond). I’ve tried to learn more about goal setting over the years. Looking back on the last year I think I did pretty well with goals, but now is a good time to make some tweaks and setup more systems so that success is more probable. Arnold is kind of a crazy guy, but one thing is for sure…he’s one of the best at setting goals and achieving them.